It's a bird! It's a plane! It's... yes, a plane — a 45-foot paper airplane. Inspired by none other than a 12-year-old, an Arizona museum launched the 800-pound aircraft, with a 24-foot wingspan, outside of Tucson Wednesday and watched it sail through the air, 2,703 feet up, at 98 miles an hour, MSNBC reported. The plane was designed by aeronautical engineers who based their design on that of local child Arturo Valdenegro, who won the Pima Air and Space Museum's paper airplane contest back in January. Wednesday, the engineers' behemoth was hauled into the skies by a helicopter and released — and the plane soared for a few moments, according to the project's live blog of the event. 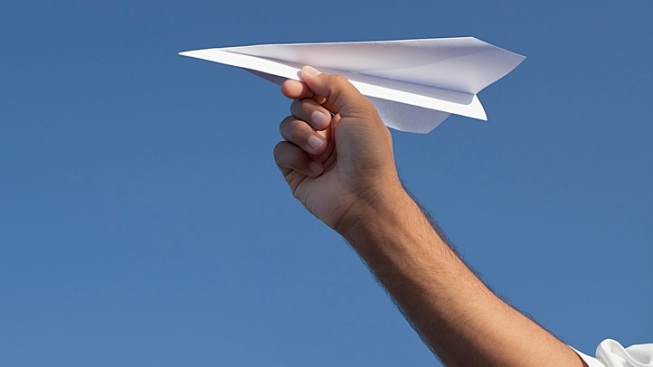 The house-sized paper plane, dubbed Arturo's Desert Eagle, had suffered some damage in earlier test runs that required on-the-go repairs before its final successful flight.